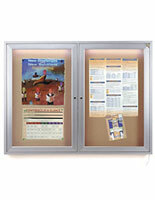 This aluminum-framed bulletin board, cork board incorporates a fashionable, satin silver finish. 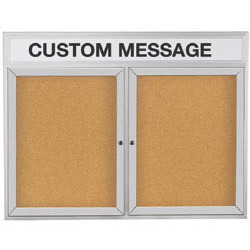 This cork board, similar to bulletin board or announcement board, also incorporates 2 acrylic, shatter-resistant doors additionally to locks and keys added for security. This is to warrant that your postings will not be tampered with. 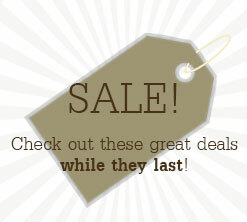 The cork surface is also extremely resilient, lasting for years to come. Another characteristic worth mentioning is its customizable header. Whether in a school, institution or for personal use, you can have your name or message imprinted on this header. 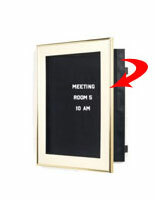 Four corner mounting holes are located on the rear of the display for wall mounting. Please Note: We do not supply the cork board with the essential wall anchors or screws. For indoor use only. 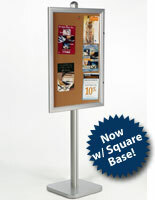 This announcement board, cork board is fantastic to be utilized known as a public message center. 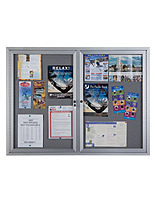 The cork board, for example an announcement board, cork board or bulletin board, permits you to effortlessly exchange any postings readily. A cork board is also a ideal method to post subject matter, notices, events, schedules, decorations, or anything else deemed appropriate. 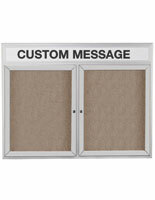 This public announcement center is an ideal cork board one would want to use in upscale environments. As an illustration, a cork board is usually discovered in hospitals, offices, banks, churches, schools, and community centers.